Keeping your car clean takes time, with the average bucket wash lasting at least half an hour — and that’s before you’ve started on the inside. If you don’t have this time to spare, you’ll need a quick fix that’ll restore your car’s shine in a matter of minutes, without the need to get all your kit out for a full wash.
Daily driving can soon put an end to that just-washed shine, but it’s impractical to wash your car every day. The steps below are quick tips for you to do some easy jobs that will make your car look better – click on the links for more information about each step. 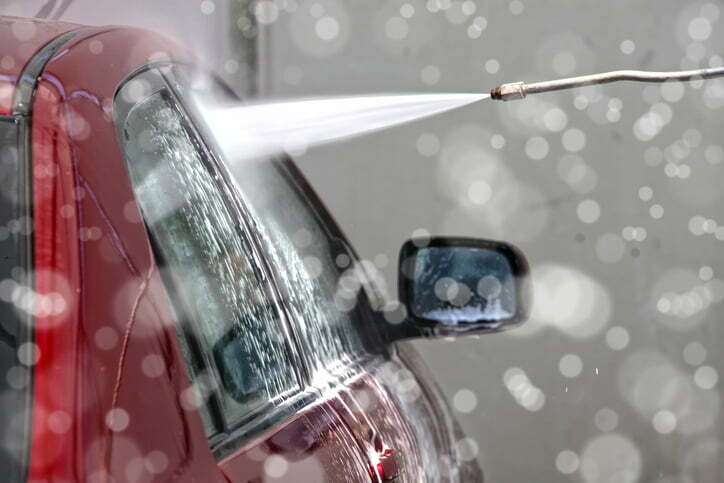 If your car’s paintwork, tyres and trim have lost their shine due to light dust and dirt, you can improve the appearance with a quick wash.
Start by rinsing your car from roof to wheels. If you can use a pressure washer or hose it will remove the dirt quicker, but if you can only use a bucket just slosh it over. You might need more than one bucketful to do the whole car. Do this in a shady spot out of direct sunlight, as quick drying could leave your car covered in streaks and smears. If you have any nasty marks like sap or bird droppings, use a specialist remover like Insect and Dirt Remover. Use the squeegee to remove excess water so you don’t have any water marks left on the car. Make sure you’ve removed all the grit on the car before you use this, or you could scratch the paintwork. But if your car is clean it’s a really quick way to help it dry and get a clearer finish. Alternatively, use Waterless Wash and Wax. This is a good option if your car has some light dirt and you want to get a quick shine. Make sure there’s no grit or heavy dirt on the paintwork, as it could scratch. Start from the top and work your way down, spraying on the Wash and wiping with a clean cloth. Use a second cloth to buff and give it a protective shiny finish. Tip – Nothing beats a proper shampoo though, so if you have a little more time on your hands, use Simoniz Shampoo & Wax to give your car a two-bucket wash. The great thing about using car shampoo that contains wax is that it’ll help to protect your car without you having to wax it. A quick way to give your car’s appearance a lift is to restore the colour of your tyres and get rid of scuff marks and faded patches. Simoniz Back to Black Tyre Shine is a spray-on product that offers long-lasting shine for your car tyres. Our tyre shine formula offers a durable finish that restores, protects and shines, giving your wheels a good-as-new appearance. And using it couldn’t be simpler; just apply the product in a sweeping motion to a clean, dry tyre, and enjoy long-lasting results. Back to Black works instantly, so it’s perfect for your 15-minute express car shine routine. The inside of your car can start looking grubby before the outside, with daily use meaning you lose that freshness and cleanliness quickly. But keeping the interior clean needn’t take ages. Simoniz has a handy range of wipes to keep the cabin looking clean and shiny — from the dashboard and trim to the seats and upholstery. To keep your car’s cabin clean on the go, invest in dashboard wipes and upholstery wipes, and keep them in the glovebox. These convenient and disposable wipes not only clean and protect interior surfaces, but also add that much-loved new car fragrance for an instantly fresher interior. If you want to keep your car looking shiny but don’t have time to wax it regularly, use a spray-on product such as Quickshine Detailer which will give you a protective, shiny finish between waxes. Our detailing spray contains carnauba wax for added durability and protection, and is perfect for providing a quick glossy finish that lasts. With its trigger spray bottle, Quickshine couldn’t be easier to use. Simply spray it on your car’s clean paintwork, panel by panel, and wipe with a clean, dry microfibre cloth. Keep a bottle in your boot for when your car’s starting to look a bit dull, or for after you’ve washed it. Your dashboard can quickly start looking dusty or faded, but keeping the dash and control panels clean needn’t take ages. To keep your car’s dash clean on the go, pick up a Simoniz Dash Restorer Pad and keep it in the glovebox. It’s handy for quickly cleaning your interior plastic and protecting against future marks, and also has a new car fragrance for an instantly fresher interior. With all the wear and tear of daily life, your car seats can get dirty and marked quickly, and they’re a part of the car we often forget about. However, there is a way to keep upholstery and leather looking and smelling great without the need for a time-consuming deep clean – and that’s with Simoniz’s range of leather and upholstery wipes. Keep a pack of seat and fabric wipes in your glovebox, and you can quickly freshen them up whenever you need to. These gentle wipes contain cleaning agents which lift dirt and remove bad odours and can be used on the go. Car windows need to be cleaned regularly to keep them free from streaks and smears that can cause dangerous sun dazzle, but this can be tricky when you’re balancing a busy schedule. Glass is notoriously difficult to clean, with normal cleaners and cloths often leaving behind residue and smears that can make the problem worse. That’s where Simoniz Glass Wipes come in. These handy and disposable cleaning wipes can be used on both internal and external glass surfaces, including the windscreen, and guarantee a streak-free finish while being tough enough to remove dirt and streaks. Keep a pack in the boot for when you need to give your car windows some TLC. And there you have it — our top tips for getting your car looking great in just 15 minutes. For more car detailing advice, don’t forget to check out the rest of the Simoniz blog, or visit the homepage to browse our full product range.